The able, veteran host, David Gregory, led off with the kind of question that such a host is supposed to ask on such a show: he asked about the hottest story of the previous 72 hours, the flap over access to contraception in health insurance plans. Did Gingrich respond? Did he weigh in on the issue that so many Americans were thinking about? ELITE MEDIA?? What is Gingrich talking about. That is, what is he really talking about. Gingrich flings that term “elite media” around every chance he gets. He must have reason to believe that it helps him with some sub-set of the U.S. electorate. What, in other words, does the word “elite” add to Gingrich’s sneering, mocking phrase “the elite media”? He protests an awful lot. Is not Gingrich, a former professor, part of an elite? Is not Gingrich, an author of multiple books, part of an elite? 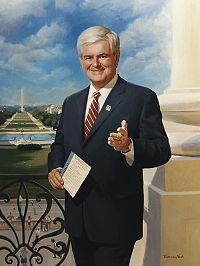 Is not Gingrich, former speaker of the U.S. House, part of an elite? Is not Gingrich, TIME magazine’s 1995 “Man of the Year,” part of an elite? Is not Gingrich, a multimillionaire consultant, part of an elite? Just to clarify, I entered the word “elite” into an online antonym finder and came up with the following list: common, low-class, ordinary, poor, worst, commoners, plebites, proletariat, low-born, low-life, poor, unprivileged, vulgar, wanting. Would Gingrich really prefer a low-class, wanting, vulgar media staffed with ordinary proletariat commoners? I request your kind support for a Mass Communications class Assignment over topic ” Elite Media”. Please share Some material, i am unable to find any. Thanks ! 1. Start a google search. 4. choose a google scholar search. 5. enter your search term and stand back.